Diagnostic Tool What's wrong with my vehicle? Does Your Car Need an Alignment? What Size Spare Tire Do I Need? Buy 3 Tires, Get 4th Tire Free Instantly. Receive a discount equal to the price of a single tire when four tires are added to the cart. Valid on select in stock tires only. Those tires for which discount is available will be identified in search results & product detail pages. All other tires and special order tires are excluded from this offer. Valid when scheduled for installation on PepBoys.com and installation is completed between 12/26/18 through 2/28/19. To add a vehicle, start by selecting a year. 5 days after 6 p.m.
Split design allows for easier installation. 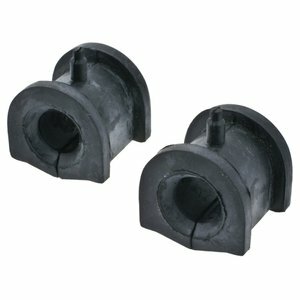 Bushings are engineered to provide long life and dependability. MOOG Problem Solver products incorporate proven design and engineering features for like new steering, ease of installation and longer life. MOOG is the preferred steering and suspension brand of professional technicians and NASCAR Crew Chiefs. Replacement can reduce front end noise. This product is not available for Shipping. Federal-Mogul Motorparts Corporation is a leading global automotive supplier offering the most comprehensive portfolio of quality products, trusted brands and creative solutions to the automotive aftermarket. Do I Need New Tires?